In 1987, the North Cascades Audubon Society was deeded the Scudder Pond property (2.8 acres located near the intersection of Alabama and Electric Ave) from Vita Armitage in honor of her father, O.C.Scudder to be "protected as a wildlife preserve." In 2015 the deed to Scudder Pond was transferred to the City of Bellingham. The pond is believed to have formed sometime before 1975, probably due to a plugged culvert located under an abandoned railroad line which caused the pond to be separated from Lake Whatcom Lagoon. Originally, runoff from Alabama Hill and water from a local stream drained indirectly into the lagoon. 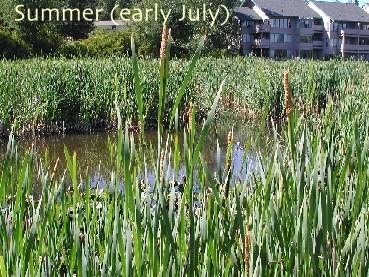 Scudder Pond and its surrounding area are designated a category II wetland (City of Bellingham, 1988) based on a I to IV basis: Category I having the highest year-round attributes. Here, in the heart of Bellingham, Scudder Pond is home to a diversity of migratory and breeding birds, mammals and other wildlife. If you look closely among the cattails you might see a pair of Virginia rails, as well as red-winged blackbirds, mallards, bufflehead, wood ducks and a great blue heron. Keep your dog on a leash and out of the pond.